If I were an artist, my medium would be ice cream. And every artist needs a muse. To that end, Tiffany’s recent post put me in mind of something I’ve been wanting to try with my ice cream maker for quite a while now: gelato. 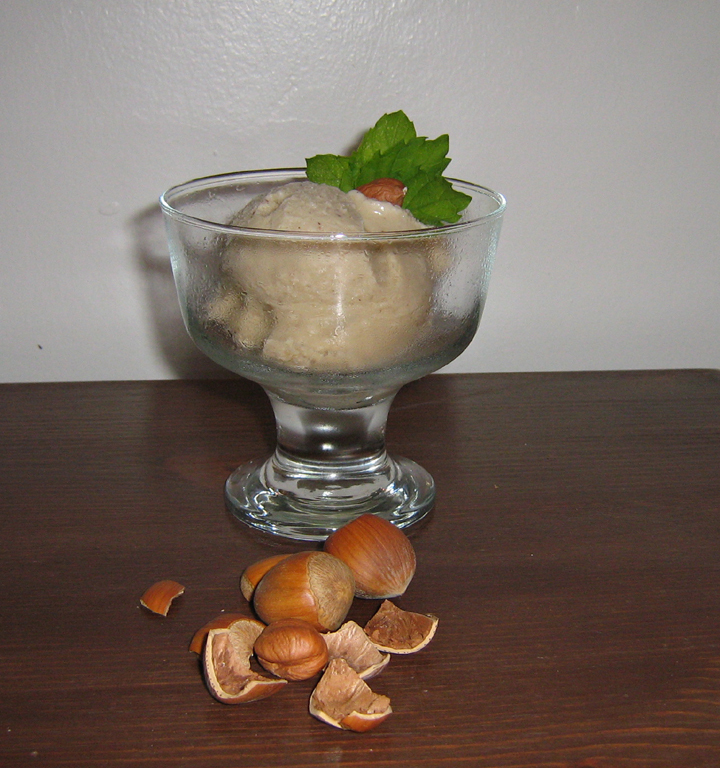 Hazelnut, to me, is not an ice cream flavour, but a gelato flavour. I’ve been making ice cream in my own kitchen for years. The secret to good ice cream is a lot of milk fat. 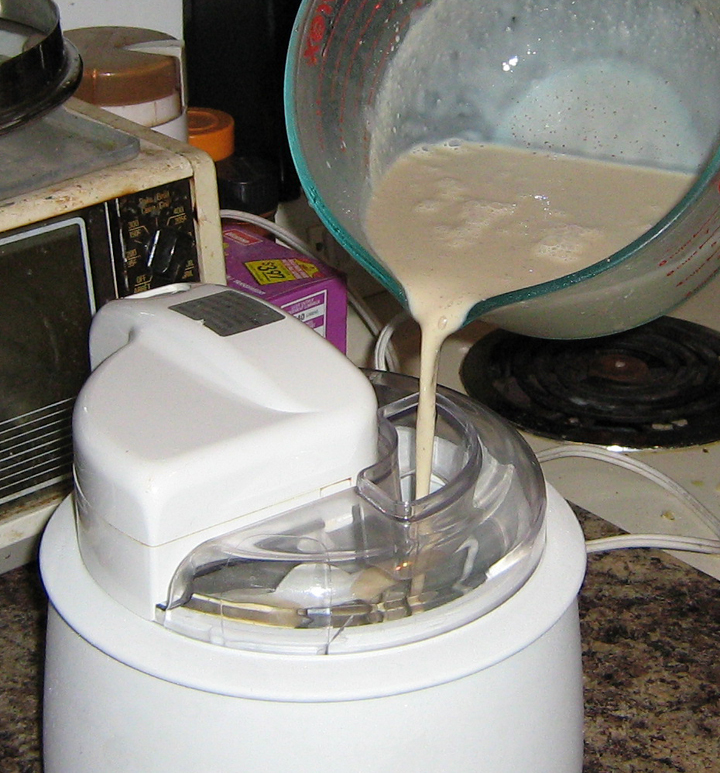 Use a lot of the heaviest cream available and a nice cold ice cream maker and you won’t go far wrong. In general, the more milk fat your ice cream has, the better it tastes; I envision some day there will be a competition to see who can make the fattiest ice cream, in the same vein as this ongoing world record alcohol content beer thing. (If you want further reading on that subject, I can recommend this book which is both entertaining and useful). Gelato, however, is a whole different ball game. Gelato is low in fat and sugar by design. This idea is somewhat blasphemous to me, but having eaten and enjoyed gelato, I thought it might be time to try a little kitchen finesse, rather than my usual “fat, fat and more fat” brute force route to frozen deliciousness. Since I was doing this somewhat on a whim, I didn’t have time to find and buy or borrow a specialty gelato recipe book, so it was off to the internet for me. Basically every recipe was the same: make a very thin custard, chill the custard in the fridge for a few hours, freeze it in an ice cream maker. The particular recipe I settled on for hazelnut was this one, mainly because almost every other one I could find was for “chocolate hazelnut”, ie. Nutella, although I would like to try a chocolate hazelnut gelato with real nuts and cocoa. The down side to using actual hazelnuts is that my local store only sells hazelnuts shell-on. The recipe calls for 5 oz. of shelled hazelnuts so I bought 8 oz., shell-on. Man, was I off: 8 oz. 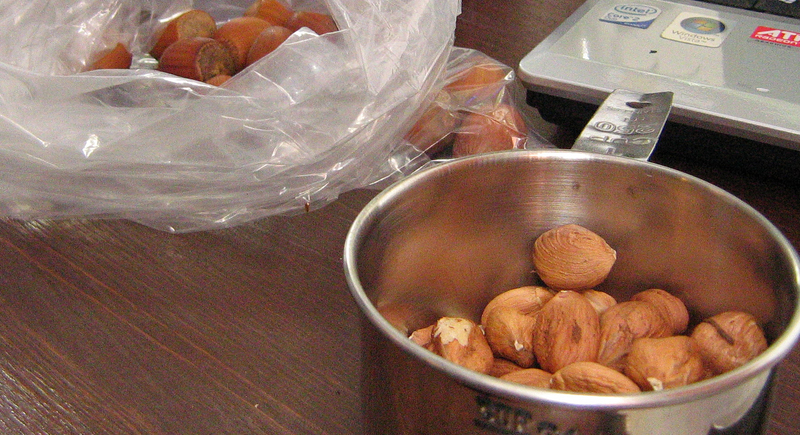 of nuts in their shells yielded only 3.1 oz of shelled nutmeat. Fortunately the store is 80 m from my house. I found the recipe’s suggestion that 5 oz. weight of nuts is 1 cup of volume turned out to be quite accurate, so if you are without kitchen scale (for which I will not harangue in this post), go by volume. I’ve never worked with hazelnuts before so the instructions to toast them and then rub them in a tea towel to remove the skins were a little vague to me. What I did was put the nuts in a single layer on my toaster-oven’s metal plate and toast them in there at 300ºF for 20 minutes. I then placed them all in a tea towel and rubbed. Some skin came off, but a lot didn’t. I found in some cases it was possible to scrape the skin off with a fingernail. In the end, however, I decided that was more work than it was worth and finely ground the nuts as they were, discarding only whatever skin came off during the tea toweling. The rest of the recipe is pretty straightforward, provided you have a candy thermometer. Don’t skip the second sieving; it may sound redundant but mine caught a significant amount of solid matter. The recipe doesn’t stress enough about leaving the custard until it is cold. I left mine overnight, covered, in the fridge. Do the same, if you can. I’m going to recommend no less than 3 hours. One thing that surprised me was how quickly the gelato set. A similar amount of ice cream batter usually spends between 20 and 40 minutes in the maker (depending on how cold the batter is, how cold the maker is and how cold the room is) but the gelato was set in under 10 minutes. It also wound up being about 2/3 the final volume I was expecting. I guess this makes sense since there is a lot more air in ice cream. The finished gelato, ostentatiously displayed. This is why I think of hazelnut as being a gelato rather than an ice cream: the flavour in ice cream is spread out among so much fat and air. Whereas in gelato, the flavour is really the show piece, and the dairy, sugar and air are just backdrop. The fragrant oiliness of the hazelnuts really comes through against the sweet, smooth, light custardy background in this recipe. Thank you for the inspiration Tiffany; if you ever face your Ice Cream Ultimatum in real life, you could do a lot worse than picking this recipe as your final frozen dairy choice. That looks so good. I love the color and the idea of nut flavor without the chunks. I keep meaning to make salted caramel ice cream (and peach and mascarpone and coconut) now that I have the means to do it at home, but I still haven’t managed to psych myself up yet. I think I’m afraid I will eat the whole batch myself. What is so bad about eating a whole batch yourself, every now and then? I suspect it wouldn’t be every now and then. I must confess that I’m not sure I’ve ever had hazelnut ice cream proper as opposed to gelato. I’ve taken to using the terms interchangeably, since you see both here sold as “Eis”. Walnut though, I’ve definately had, as maple walnut (which is an underrated gem). The nuttiness comes through, but maybe because of the pieces of nut? I still can’t imagine buying an ice cream maker. Your experiments sound fun (both of you) but I can’t buy one for the same reason Jessica is afraid to make salted caramel; fear of my own lack of will power. Combine that with my aversion to single purpose devices, and, well, I just can’t do it. how much salt does there have to be in the caramel to qualify it as salted caramel? I’ve made caramel before. It’s actually not hard, just requires some patience to cook the mixture to the target temp. I flavoured mine with cardamom. Colin, I’m not quite ready to accept that gelato is absolutely the way to go. I think you should do a taste test. Totally. This calls for a frozen-dessert face-off.